Whether you're starting from scratch or trying to bring some order to an existing garden, any landscape can benefit from a little bit of planning. More importantly, organizing your daydreams onto paper is fun! 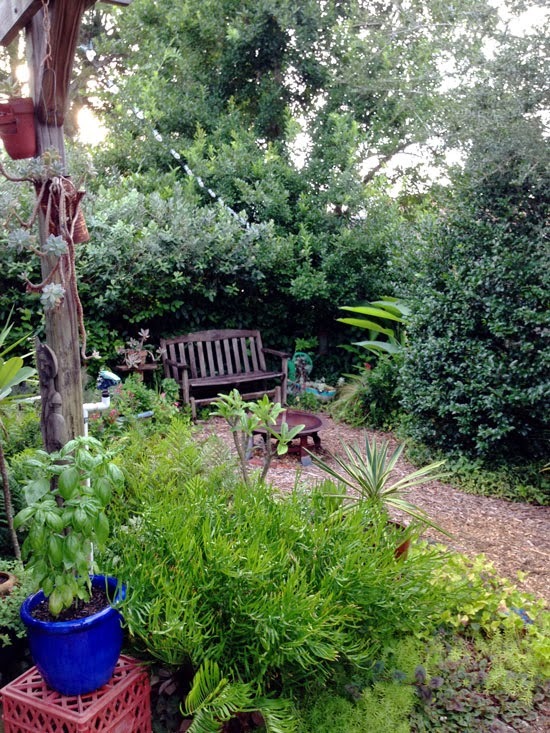 In my last post I sung the praises of real gardens; loved patches of dirt with weeds, unfinished areas and a wealth of potential. Now I'll show how to visualize those possibilities. 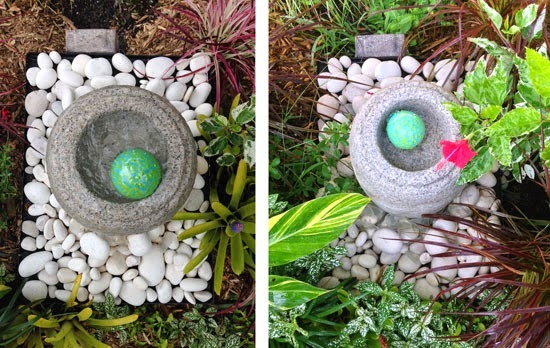 Put some garden boots on those cold feet and turn your yard into a beautiful garden with these 12 creative tricks and ideas. To show you what a difference time can make, I'm using the two gardens above as examples. The first one is my own, which was started from scratch just last fall; and the other is that of my neighbor Chris Dailey who started his own garden in a similarly sized lot over fifteen years ago. 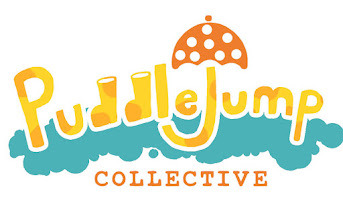 He claims to have flown by the seat of his pants and just uses the space to play around, but given that he's the horticulture manager at the Jacksonville Zoo and Gardens, one would suspect that he knows what he's doing. While the relaxed approach certainly works, it's also useful (not to mention a lot of fun!) to start with some sort of a plan. The best-looking gardens look like they were built in a day, but in reality they were planned years ago and had to go through many phases and changes to finally arrive at their 'finished' looking state. Oftentimes the gardener even took a 'fly by the seat of your pants' approach. Either way, the trick is to prioritize and plan things out for the long haul. For example, some of the things that I wanted in my garden were fruit, shade (but not too much), privacy and wildlife. As it turns out, a handful of shrubs and small trees were able to accomplish all of those things! I planted an evergreen hedge of native Simpson stoppers along one fence for privacy, to hide the ugly fence and to attract wildlife; and another two to grow as trees. Citrus trees went in the front yard where they'll get lots of sun and their fruit won't land in the yards of neighbors. While planting these trees and shrubs didn't take a lot of work, I put a lot of thought into the plants themselves and where they would be planted since they'll be there for many years to come. With enough creativity, patience and determination, you can design the kind of garden that others only dream of. But the important question is really 'what is the garden of your dreams? Are you wanting to grow your own veggies, show off a collection of plants or just create a peaceful place to kick back at the end of the day? 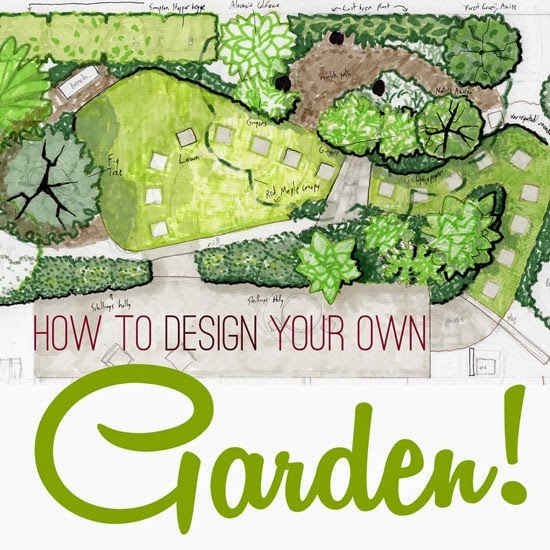 Start your garden plan off the fun way by listing off all of the things you want to create, problems you want to solve and plants you simply have to grow. 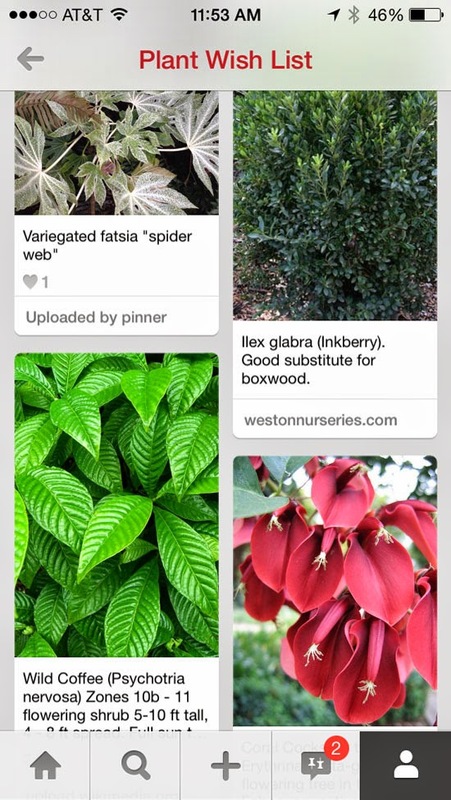 I've always kept a plant wish list in my notebook, but have now made a board on Pinterest where I can collect them as links and photos. 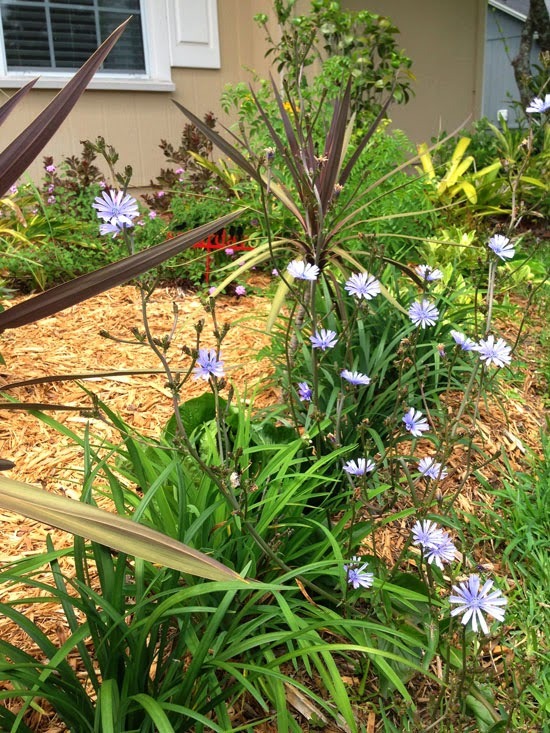 When we first bought this house, I wanted it all; a jungly tropical getaway, a haven for wildlife, a small lawn where my kid can play, an outdoor dining area, a vegetable garden, a collection of tropical shade plants, lots of flowers for the butterflies... The list went on and on. Eventually I realized that I really could do it all, just as long as I plan out the important stuff from the start. I filled up my notebook with ideas and they soon turned into a garden design. 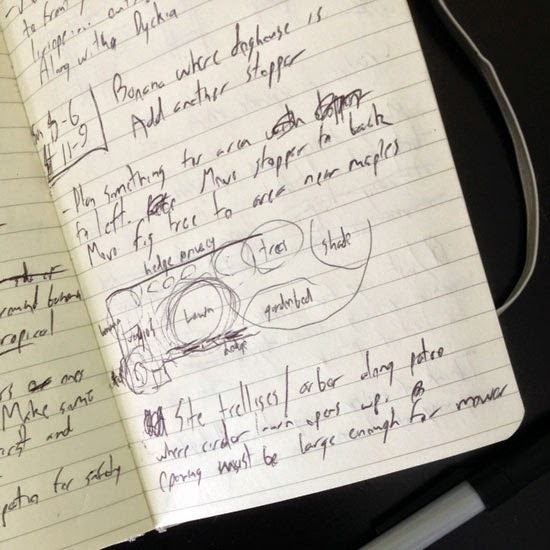 Walk around your lawn with a little notebook and jot down a bunch of notes. Walk from your back door to points of interest like a compost pile, a patio or a hose bibb and try to visualize where paths and openings will go. Trip on a tree root? Jot it down. Find a bush you'd like to remove? Make a note of it. Get an idea for a really cool water feature? Make yourself a reminder... you get the idea. Make lists of all the plants you have, all the plants you want and all the features you'd look for in a plant (Pinterest is good for this) and then try to think of where they would go. Think of other plants that would live in the same beds and think about how they'll look in winter. Now make a list of plants to use with winter interest, and while you're at it, plants with spring, summer and fall interest. Use your little notebook and your imagination to propel your garden into awesomeness. Don't bother with exact measurements here. Just draw a simple sketch of your yard as it exists today, along with any big trees, paved areas or structures that are there to stay. Now lightly draw an outline around any areas that are shady, wet, dry, rocky, rootbound or have a steep slope, as well as any issues you'd like to resolve such as poorly drained areas or eyesores. This step is important because it will determine where you plant your garden beds, make paths and choose to grow your plants. 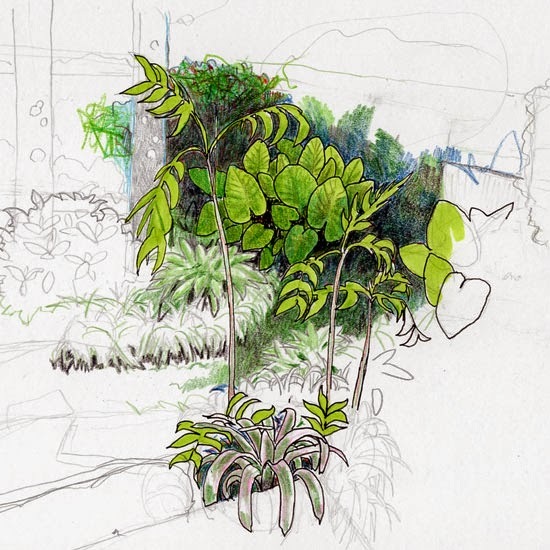 Garden sketches don't need to be pretty or concise. Once you've gotten an idea of what your garden is like, (you might want to take a photo or copy of this for future reference) you can start drawing 'bubbles' to represent the different spaces and gardens you want. In my own bubble sketch I've made a bubble to represent the open area that gets a lot of sun, the area shaded by maples and neighbor's trees, a portion of the yard that are too rootbound for me to add plants, etc. Within those bubbles I was able to plan a shade garden, paths, areas for sitting, a lawn and hedges. It also helped me determine the shape that the beds will take. Those innocuous little trees in 1-3 gallon pots grow a lot faster than you'd think, and so do many of the other plants from the nursery. Research how large and how quickly your plants will grow before planting them, and give them plenty of room to spread out. This doesn't mean that you have to let weeds or mulch occupy the empty spaces between them, however. You can plant perennials or annuals between the plants to keep the space looking attractive and relatively weed-free while you wait. Remember my water feature post from a couple of months ago? I knew that the plants would eventually grow and need to be moved, but I had no idea that they would grow so quickly! I've even had to turn off the fountain so that the water doesn't drain away on the plant's leaves. Whoops. Keep an eye on your own garden and look for any plants that seem to have gotten too big for their breeches. Vines, for example, can run amok so quickly that you may rue the day they were planted. While many plants can be dug back up and relocated the next season, it's more difficult to move established trees and shrubs without setting them back a bit or killing them outright. Gardens are supposed to be a respite from the busy world, but without enough space for your eyes and feet to wander, a garden quickly turns from an escape to a panic attack inducing jumble of chaos. That's why lawns have been popular for so many years and why 'outdoor rooms' are quickly gaining pace; they provide a place from which the garden can be enjoyed! If you're the impatient type who wants to instantly replace all of your grass with other plants, this is a good excuse to take your time. Whether it's made of turfgrasses, mulch, stone or gravel, leave an open space in the garden where you and visitors can gather or step back and take it all in. 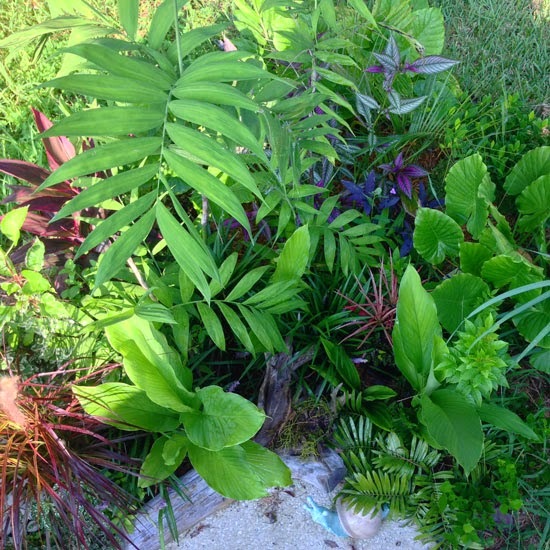 Chris Dailey put a lot of thought into the plants used in his sanctuary, but left room to enjoy them. Chris Dailey's backyard has no lawn and only a small patio, but it has lots of spots where visitors and himself can rest their weary legs. Another thing to consider is making sure that the entry points to your garden (and home) are wide open and accessible. It's tempting to plant all along the edge of the driveway (I'm guilty of this one) but is there enough room for visitors to get out of their cars? Is there enough room for you to walk side-by-side with a friend in your garden or do you have to squeeze in single file? A congested garden makes visitors feel as if they're not allowed to explore, so open up those paths up and let them wander. Good fences make good neighbors. A runaway plant sprouting on the other side of a fence, on the other hand, is a sure way to make an enemy. 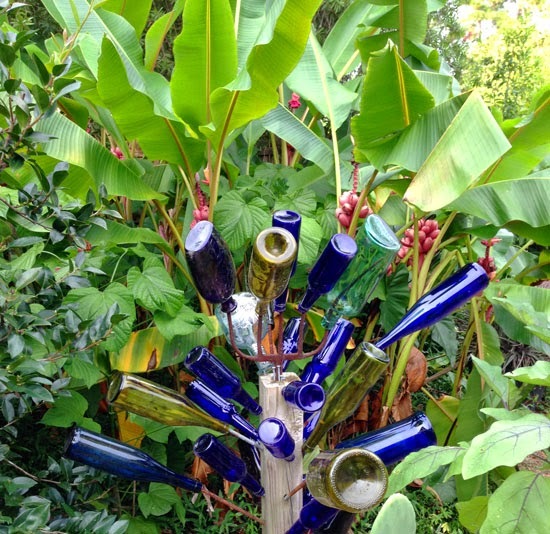 Before you try to recreate the towering cobalt blue bottle tree you saw on Pinterest right along your fence, consider what your neighbor might think of this garden art. If you'd love to plant a peach tree at the edge of your property, make sure that your neighbor also likes peaches enough to harvest those on their side of the tree. Otherwise they'll end up with a lawn of soggy, rotten fruit. I'm seriously inspired by Chris Dailey's bottle tree. So keep that bottle tree in the backyard where only a privileged few can enjoy its unique beauty. Chris Dailey keeps the landscaping in his front yard simple and showcases his eclectically awesome taste in the backyard where he can go all out. 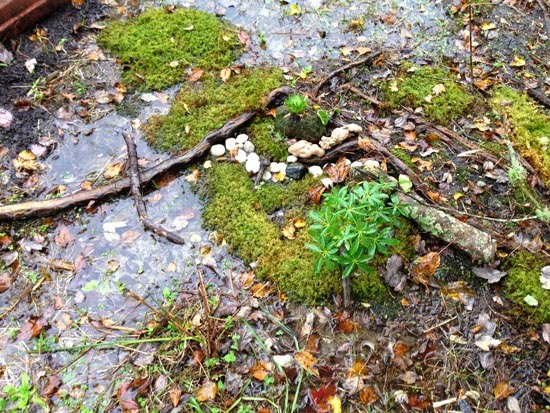 There are so many fun and creative things I'd love to do in my front yard, but the truth of the matter is that others in my neighborhood are affected by my garden too. You don't have to be boring; just be the kind of thoughtful neighbor that you yourself would like to have. Block parties certainly help. Luckily for us, not all gardens were created equally. 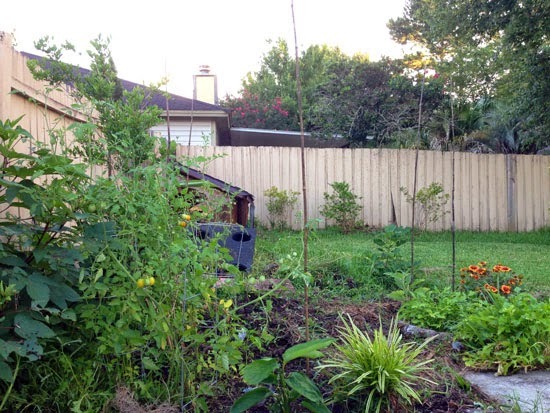 My first garden had a dry and sunny front yard and a back yard that alternated between dry and flooded. My second garden was hot and dry everywhere but one small spot. My current and third garden has it's own set of challenges - erosion, rootbound soil and a total lack of privacy, to name a few - but I prefer to look at these as opportunities. Organize your project into different phases to keep it looking presentable over the years. You can do this by divvying up the garden into different sections and planting them one at a time, or you can start along the edges and work your way in. If you'd like to build a garden shed in the corner of your yard but don't yet have the funds, plant something that will be easy to destroy when you hustle up enough cash. A vegetable bed would be useful and easily replaced after a frost, while a fast-growing and short-lived shrub would provide height and substance in place of the shed and could be cut down at construction time. This side of the lawn is overgrown with weeds, still has junk from the previous owners and has absolutely no privacy. While I wait to get my act together and for the trees to grow, I can still use this space to grow vegetables. If you want to replace a lawn with gardens, you can also slowly chip away at them by planting island beds and borders and extending them until there's nothing more than a grass path that can be replaced by mulch, hardscaping, gravel or groundcovers at your leisure. I'll be doing just that in my own garden over the next few years. Since anything you plant now will have more time to grow, it's a good idea to choose plants that you wouldn't mind seeing more of. If you'd like to have an evergreen groundcover in your garden to provide winter interest and continuity, choose one that you wouldn't mind dividing and spreading throughout your garden in the coming years. Lilyturf (Liriope) isn't a glamorous plant, but it's evergreen and easily massed in sun and shade. When we bought our house, it was absolutely imperative that we had a good citrus tree to feed our family and friends in winter. Rather than just buy any old citrus, I did my research and decided upon one that would be cold-hardy, resilient and tasty, and shopped around at local nurseries until I found the perfect citrus tree for my garden - a 'Kimbrough' Satsuma - and gave it pride of place in my front yard. It is small now, but will become the most dominant feature of the front yard several years from now. If you're not sure of which plants are the best, trust your gut and plant more of the bulbs that you loved in your mother's garden as a child, or the confederate jasmine whose heady aroma brings back memories to this day. It can be difficult to translate a garden into a flat overhead view on a sheet of paper, but there are tools to help you visualize the end product as you draw. The pros start out by measuring and triangulating the distance between each door, window, tree, fence, sidewalk and fire hydrant, but since I spend all day hanging out with my baby, doing this was a bit harder than I had planned. Babies aren't very good at holding onto tape measures, as it turns out. Instead, I pulled up the satellite view of my property on Google Maps and copied down the locations of the existing patio, trees, etc. onto paper to start off my layout with more-or-less accurate dimensions! A low-tech but useful alternative for 'eyeballing it' is to stand on your roof or a ladder and take photos from a bird's eye view. You can also take photos of the garden from important vantage points like your back yard or the street, and sketch over them with a drawing app on your phone, tablet or computer. You can also print it out on paper and trace over it with a pencil. There is no wrong way to garden as long as you enjoy it. Don't obsess over the right tools for designing a landscape. A piece of paper folded up into eighths is great for jotting down ideas and plant lists when you're at work, and a regular #2 pencil is all you need for drawing. A ruler is nice for drawing straight lines and stencils are ideal for the circular shapes of trees, but the edge of a cardboard box or the rim of a medicine bottle will work pretty well too. 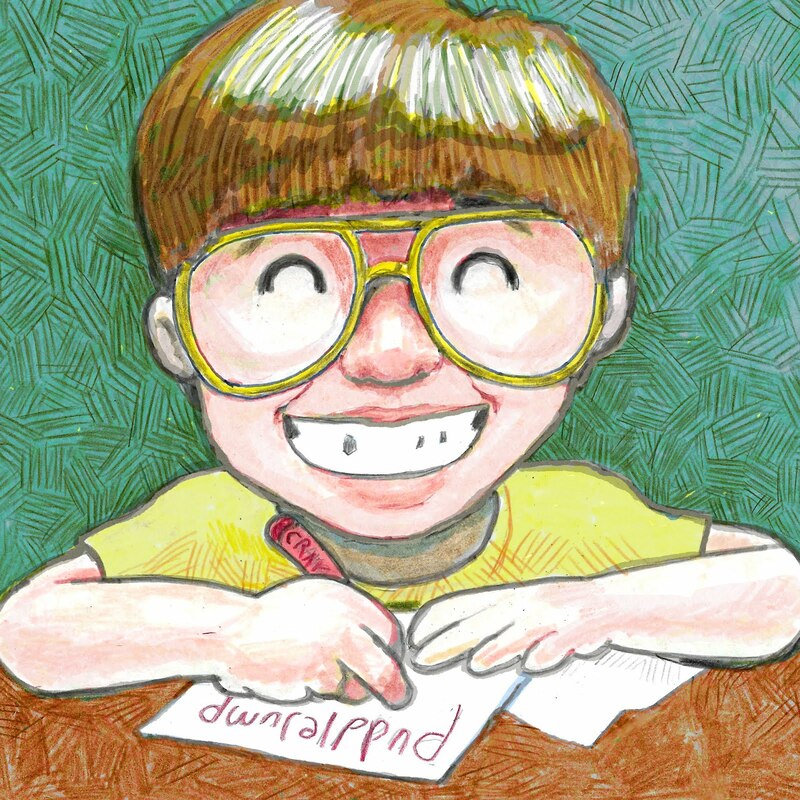 The most useful tool you can own, however, is an eraser, and the plastic ones sold at arts and crafts stores are the best at erasing without smudges. 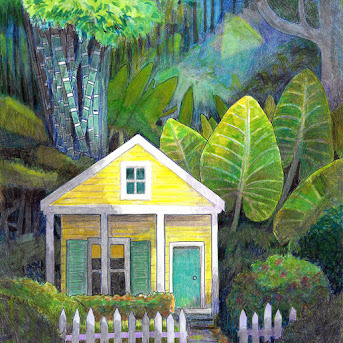 This is a drawing that I started when we first bought our house when I was daydreaming about what I'd do out there. 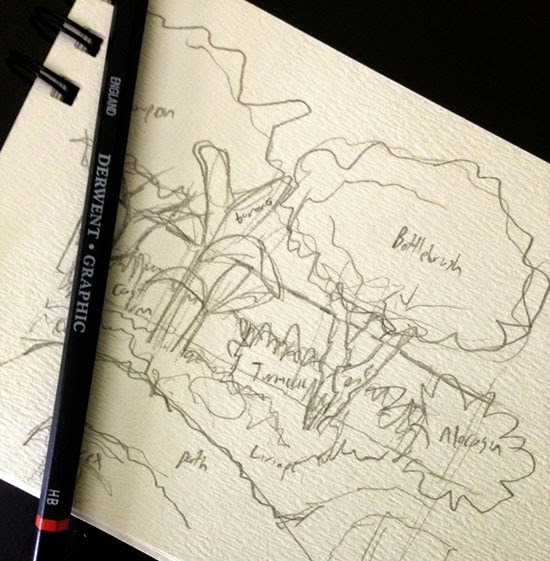 Since the drawing helped me plan and visualize the garden, there was no need to finish. There is no imaginary landscape architect sitting over your shoulder to scold you for your unfinished and sloppy scribbles, so just have fun with it! If you're stumped as to how to go about digging beds and getting started once you've devised a plan, check out my post Planting a Garden from Scratch. Still need some more ideas? 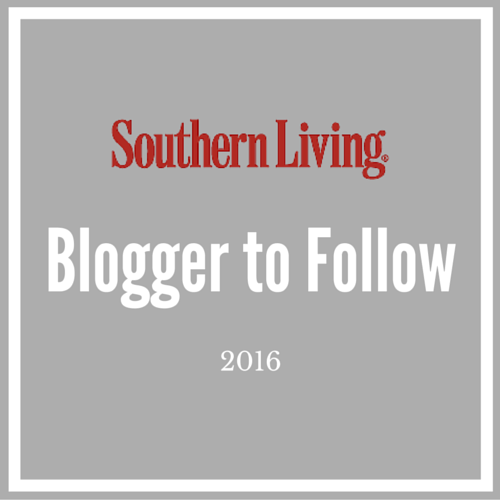 Check out the posts below and keep your eyes peeled for a few follow-up posts! 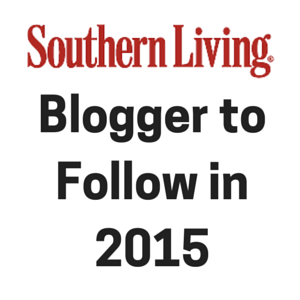 If you have some tips of your own, please share in the comments below! We know that with the number of available gas lawn edgers out there, you really feel confused. This confusion is further augmented because each and every one of these products claims that it is the best and the one that you should buy.